I'm very excited to share something with you that I've been working on with some help from a few members of our forum. It's called "The HaLo Project - The Magic of Harry Lorayne" and the following video will explain more about it. Volume 2 is complete and will soon be available for download at Murphy's Magic (check here for updates). My hope is that the HaLo Project with help magicians discover or rediscover the wonderful magic that Harry has created over the years. I'm very grateful to him for his willingness to allow me to share his magic with you and I'm honored to count him as a friend. Great idea, Rudy! I just sent the payment. Congratulations to Mr Harry Lorayne, and congratulations to Rudy and the other contributors who are making this happen. I'm especially pleased about the fact that this will draw attention to some hidden gems in Harry's books, and help give a high profile to tricks that may otherwise be buried or ignored within the large body of his work, and thereby raise awareness of some great magic. Video teaching to accompany the books is also a real positive; in today's era we benefit from the best of both worlds, books and video, although of course these videos will give access to some of Harry's magic even if you don't have the books - another good thing. Rudy picked some fine examples of Harry's effects for this first "installment." Even some help from Johnny New York. Well worth the re-visit of Harry's tricks. There's another thread asking about royal flush endings, there's enough material here to keep you busy for a while. Good job Rudy and Johnny and thanks to Harry for the material. Ditto to each statement in Arthur's post! I'm so glad you are doing this Rudy! This is a great way to re-enter overlooked tricks into our repertoire. I personally love fourtitude! I've already got volumes 2 & 3 nearly completed. I just need to record the live performances. Volume 2 is going to feature an effect that I truly believe is the best card trick that I've ever learned. I'm not just saying that. It's something that I overlooked in Reputation Makers and that Johnny NewYork submitted to me for the HaLo Project. I performed it for some friends just the other night and they were absolutely amazed! My friend Drake (a non-magician) said that it was the best trick that I've ever showed him (and he's seen a LOT of magic). I don't know how it works, but it is most definitely a Reputation Maker! You know Rudy, this would be an excellent time to advertise that a few of these tricks come from Jawdroppers, which is out of print. These videos might be the closest you can get to the material nowadays. Is the cost for this first Halo Project 10.00 via PayPal. Will it continue at this price I need more information please. Welcome to the Magician’s Forum. It’s $8 for those members of our forum who contribute to the conversations here and who have the membership status of “Inner Circle”. Chi Han - you took the words right out of my mouth. I just emailed you both the link to the video a minute ago. Please let me know that you received it. Got it, breaking out new deck and getting ready to celebrate my birthday today. I've been practicing Against the Odds. Even though it's almost self working, there are a lot of little details involved. It's not as easy as it Rudy makes it look. I want to make sure that you're able to perform this and apologize if my explanation wasn't sufficient. I've created a subcategory in this section so that we can discuss your questions and concerns. The password for that section is the same password used to access the video. Thanks Paul! Again, I appreciate your willingness to help with this project. I also have Michael Vincent on board! He'll be filming his contribution the HaLo Project while he's lecturing in Lebanon. I know how much you fellas love Harry and how much he's influenced your magic. thanks for the extra effort in creating a subcategory for questions and discussions about HaLo Project. Where can we find this subcategory/link? Click "Volume 1", and enter the same password you received for accessing the digital video download. That should give you access to the sub-forum dedicated to discussions on the Volume 1 video. Is the HaLo Project vol.2 already out or has it just been produced? Rudy is the best one to answer that. He has posted a video with a performance of one of the great effects included in Volume 2 (link). It was this project that Paul Gordon mentioned on FB that got me to find the forum. Thanx EndersGame....just saw your reply and Rudy comment. Is anyone experiencing problem in accessing to the vimeo video HaLo Project vol. 1? Thanks Dave. I'm using the password associated with my purchase, too. It worked fine until a week ago (or so). Has it an expiration time? I've contacted Rudy. Hope he can fix the problem. Wow. Rudy replied via FB and he told my password was accidentally changed. Well, vimeo is working now but....Wow, double wow....the great news is that the Halo Project vol. 2 is now ready and can be purchased!!! Not all evil comes to harm!! 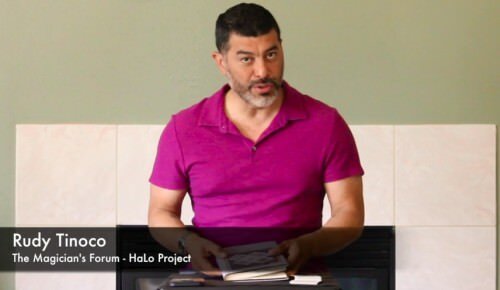 Wow, double wow....the great news is that the Halo Project vol. 2 is now ready and can be purchased!!! Yep, and it's excellent! I especially like Four by Four (great mentalism routine) and Sandwich Locator (very clever), although Color Gathering Plus is also excellent.